These eight places have low unemployment, a good quality of life and decent incomes, according to government data compiled by CNNMoney and nonprofits Opportunity Nation and Measure of America. 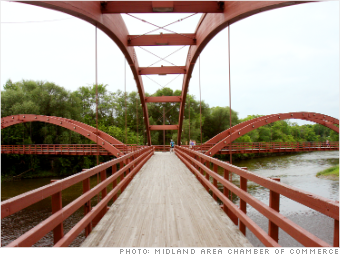 The town of Midland -- the biggest in the county -- credits large businesses with its success. It's the home of Dow Chemical, which has helped attract other companies, including a joint venture with Corning, a Semiconductor company, and a tester of automotive lubricants. "Once they come, we work very hard to keep them here," said Councilwoman Diane Brown Wilhelm. That work involves sprucing up the downtown, so it's "walkable and attractive for young and old people alike," said Wilhelm. It also includes top notch fire, police and road services, and doing it all with minimal taxes and regulation, she said. In addition to the above statistics, CNNMoney worked with the nonprofits Opportunity Nation and Measure of America and considered inequality levels, preschool enrollment, college degree attainment, housing costs, violent crime rates, school drop out rates and access to banks, doctors and grocery stores in compiling this list -- which is not all inclusive but rather a sampling of towns across the country. To qualify, the county needed to be at least 20 miles from a large city and have a population over 10,000. In addition, the median household income needed to be close to the national average, and the county had to beat the national average in the areas of unemployment, poverty and inequality levels. Unemployment levels are for December, the most current available at the county level.